The White Stripes’ Icky Thump was released on June 15, 2007. In honor of its 10th anniversary, we’ve republished our review, which ran in the July 2007 issue of Spin. Jack White makes a lot of strange noises on the appropriately titled Icky Thump: There’s an unnerving, high-pitched guitar whine that’s straight out of a Tom Morello fakebook (we’ll call that one “the Squawk”); a brooding, bubbling-under-the-surface organ hum (to be dubbed “the Surge”); and a discomforting, annoyingly childish yelp (actually, on further examination, that’s just Meg White’s voice). Recorded in Nashville in three weeks, the band’s sixth album is a noisy, cranky piece of work. Jack’s ever-rueful lyrics raise the sighing cynicism of 2005’s Get Behind Me Satan to a roaring snarl, while the music returns to its ferocious slash-and-burn roots, with no shortage of strangled distortion. One can only imagine what the bosses at Warner Bros. thought when they realized that Jack and Meg’s major-label debut would be the least fun album of their career. Icky Thump kicks off with the title track, a menacing road tale about “sittin’ drunk on a wagon to Mexico” that eventually turns into an anti-anti-immigration rant, anchored by a guitar riff that four out of five classic-rock fiends will compare with Led Zeppelin’s “Bring It on Home.” It’s followed by “You Don’t Know What Love Is (You Just Do as You’re Told),” which opens with a midtempo stomp and a canny dis: “In some respects / I suspect / You’ve got a respectable side.” After untangling some joyful guitar lines, Jack squints, turns up the organ, and invokes the title’s condescending chorus. It’s brutal, and it’s the best song on the album. “You Don’t Know” also establishes an intriguing dark-side-of-the-flesh refrain, as the album takes on everything from misogyny (a gleeful mariachi cover of Corky Robbins’ ‘50s near hit “Conquest”) to Humbert Humbert-style leering (the creepy “A Martyr for My Love for You,” in which a 16-year-old girl is wooed and then abandoned—for her own good, of course). Jack has never committed himself this consistently to a lyrical theme, but he seems to have dealt his hookiest nujmbers to the Raconteurs. Even die-hard Meg supporters will find the droning bagpipes and exorcism-style chants of “St. Andrew (This Battle is in the Air)” a waste of hard-drive space. This is the Stripes’ longest album yet, but you don’t need to examine the running time to know that; toward the end, Jack flicks out a handful of tunes (“Catch Hell Blues,” “Rag and Bone”) that he could have written while slumbering away on his color-coordinated pillow. But salvation comes on the closer, “Effect and Cause,” which reimagines the vicious boogie of the Stooges’ “No Fun” as a campfire sing-along. 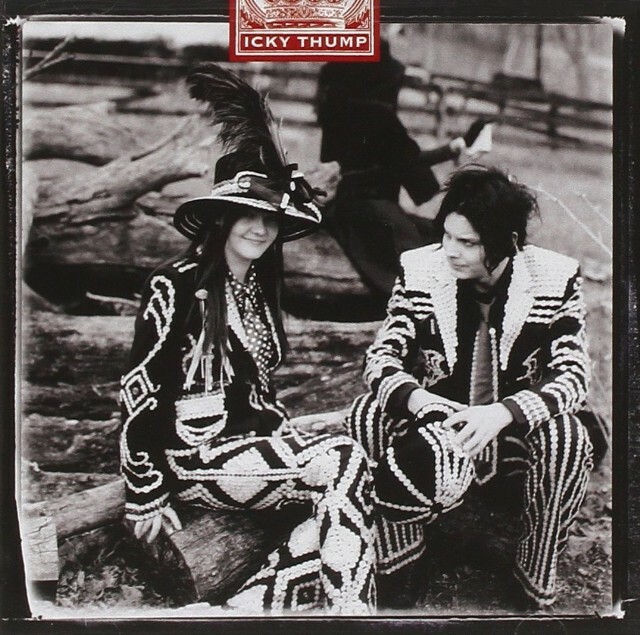 Jack gives a lover a firm talking-to, but the stern message could also be directed at the band’s detractors: “You can’t take the effect / And make it the cause.” Icky Thump is full of such bracing, finger-wagging admonitions. Unfortunately, too many of them make the songs feel like sermons, rather than hymns.